Our tracker has special facilities to protect landings against the direct entry. At that, there is no need to keep your landings on same server with the tracker. The protection base is checking of the time gap between the click is passing through the tracker and landing opening. In case too much time is used (5 minutes as standard), there is to be opened an empty page instead of landing. The IP and User-agent matching is checked as well. This code is also available in each edit window of the landing. 2) Paste it into the begin of your landing's code. 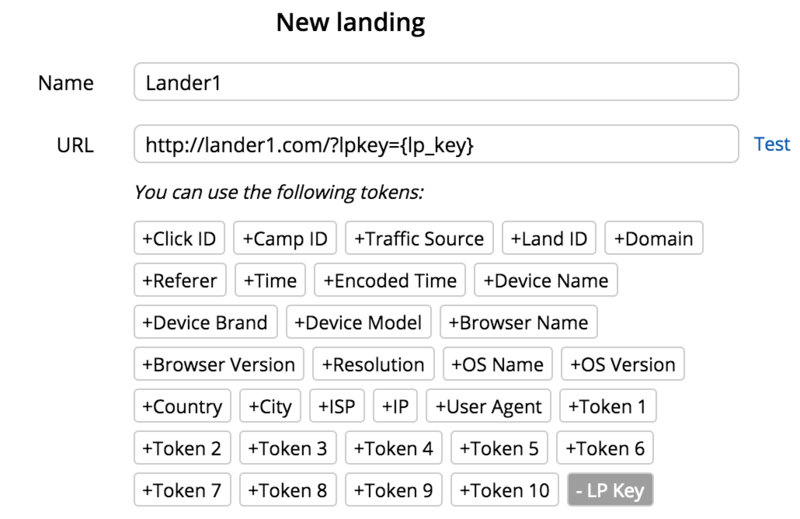 3) Move to the landing's settings and add LP Key token to the URL in order to provide the key to the landing. Now your landing can not be opened without the click through Campaign URL. Replace xxxxxxxxxxxxxxxxxxxxxxxxxxxxxxxx with your LP Key and https://domain.com with campaign domain. Now you don't have to hide referer because it will always lead to “white” landing page.